This regular visitor looked in on me while sampling the ivy and heather outside my window. The black-tailed deer family that crosses our yard most days was coming through again Monday just as I learned about Oregon Senate Bill 373, a proposal for a program to rid participating cities of “urban deer” by killing them and giving the meat to food banks. This little doe and her relatives needn’t worry. First, they hang out well outside the city limits of Albany. Motor vehicles are their main threat as they cross county roads. More important, the bill prompts many unresolved questions. And even if it advances, any effort to cull the numbers of Oregon’s urban deer is years away. SB 373 was sponsored by two Republican legislators from far northeastern Oregon, Sen. Bill Hansell of Athena and Rep. Greg Barreto of Cove. After it was printed, Sen. Steiner Hayward, D-Portland, signed on as a cosponsor. 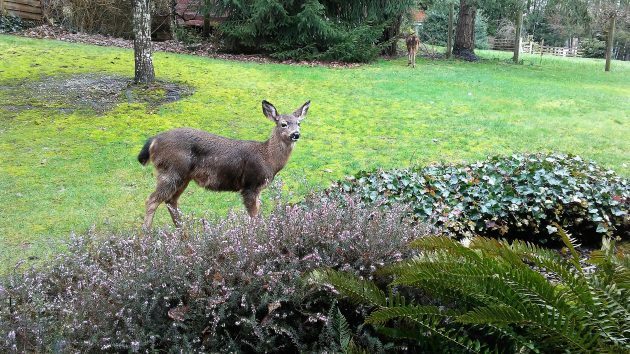 The bill would require the Oregon Department of Fish and Wildlife to write regulations for a pilot program under which cities could ask for their resident deer populations to be thinned. From Hansell, the Senate Environment and Natural Resources Committee heard why he wrote the bill. He spoke at a public hearing in Salem on Feb.13. The city of Joseph measures a mere 0.8 by 0.8 miles, Hansell said, and has counted 150 deer within the town limits. The deer have become a nuisance, and the mayor asked for the legislature’s help. Other Oregon cities also have deer problems. Hansell named John Day, Ashland and parts of Portland, among others. ODFW is neutral on the bill but voiced concerns. The bill would add to its workload. More important, it’s very difficult to get rid of deer in cities, where the animals live mostly on private property and the use of firearms is illegal, though under the requested regulations cities might make an exception for contract hunters. Even then, rifle fire and dead animals in back yards would not sit well in residential neighborhoods. ODFW suggested that cities would be better off making it illegal to feed wildlife within their limits. Indeed that is one of the requirements if a city wanted to reduce the numbers of urban deer in a program of the kind envisioned by the bill. Wildlife officials also suggested putting up deer fences and giving advice to city residents on not planting anything in their yards that deer like to eat. And then some idiot shoots the neighbors dog, or worse a child. This is insane. It is my belief that there is a State Statute prohibiting feeding of wildlife now. It there is there is no need for the Cities to enact an ordnance which would say the same thing. As to planting something the deer won’t eat. That theory doesn’t hold since we have seen deer walk through our yard, two or three in a row, and each take a nip off the “Deer Resistant” foliage. A few days later the same thing happens again. Short memories or different deer? There places on the east coast that have the same problem for years and are still fighting it. I have seen deer feeding on the Linn County Court House lawn during the night – they have been doing it for years. Fences are not effective unless they are over 8 feet high and even at that some will try to jump it and succeed. A six foot fence is generally effective for blacktail deer. I have been doing a camera survey of a gated community with a six foot fence that has effectively prevented deer from entering since a record has been kept, for over 4 years. The deer inside the fence have been tagged so very easy to verify. Looks like some legislators are bringing up a problem faced by constituents. The proposed solution won’t work for many reasons. So what will? If it’s a big enough problem, a reasonable solution will rise. If not……..
Oh, most of the serious hunters near my last gig put away their fire sticks. They found bow hunting to be more rewarding as well as more challenging. More about the hunt than the kill. Either bow or gun is fine with me, as long as they hunt for meat and skill. Hunting for trophy’s is just braggadocio. Hunting within the city is plain stupid, unless by a professional to protect citizens. Deer are not much of a threat to anyone, and a young dog is more than able to keep deer away. In fact, I have a cat with delusions of grandeur (much like Gordon Shadel) who would relish chasing down some deer. Once again Bob reveals his ignorance. No cats, no dogs, no trophy takers. But the Albany city council apparently would have authority to hunt for troublesome deer after getting the all-clear sign from ODFW. I can see it now, Mayor Konopa and Councilor Olsen stalking Bambi in the blighted CARA-area. Now that I would pay money to see…. Whatever they do for deer, include turkeys and other vermin I’m not aware of.